Ministry Mission Statement: Our group of catechists, headed by the director, is responsible for the religious education of children in grades Pre-K4 through eighth who do not attend a Catholic school. More than 275 children are enrolled and there is always a need for more teachers and volunteers. The process of preparation for Confirmation takes place over a two-year period, beginning in the seventh grade. Our preparation process includes religious education in conformity with the Catechism of the Catholic Church, scripture and tradition, Church history, stewardship, retreats, candidate interviews with the pastor, and individual assignments. A key element in preparation is helping a young person to determine the importance and relevance of the specific teaching to the Church and their life. The Confirmation class raises money each year from their Advent Candle sale to support Martha Griswold's Campus Ministry through the FOCUS and to help the families affected by recent natural disasters. Please click here to access our "Frequently Asked Questions" about Confirmation. If you need any additional information, please feel free to use the form below to contact us. Confirmation Practice - Thursday, May 2nd - from 6 - 7:30 p.m. - All Confirmandi and their sponsors should report first to the Family Center for line-up and further instructions. 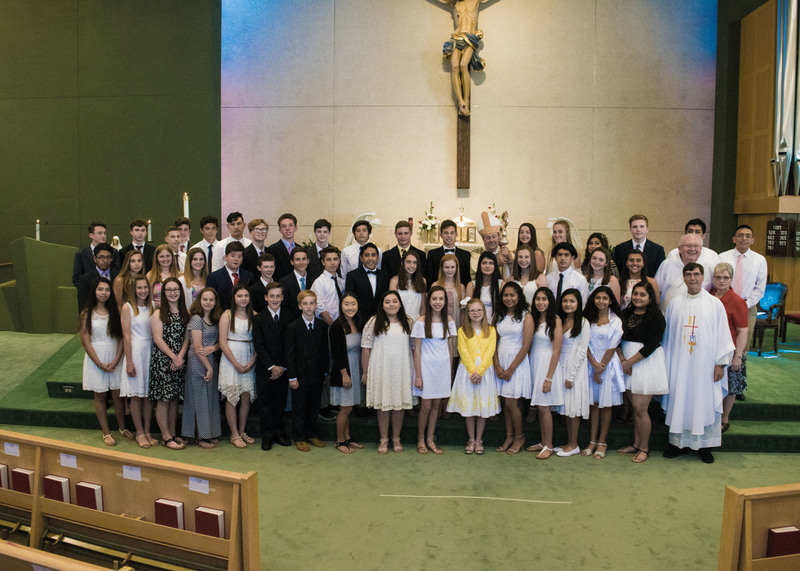 Confirmation - Sunday, May 5th - Time will be 3 p.m. - All Confirmandi and their sponsors should report directly to the Family Center for line-up no later than 1:15 p.m. Parents and other guests may go over to the Church after drop-off. Registration for the Summer Session and also for the Traditional Religious Education Year will be in April. Look for our registration date in the upcoming bulletin. Questions, please let us know. Our phone number is 843-681-6350 ext. 248 or 249. For more information on how to register your child, please click on this link. All Catechists must complete the Safe Haven - It's Up To You online training. Information about Safe Haven - It's Up To You can be found on the Safe Environment page, along with the Diocesan screening forms. Click Here for more information about becoming catechist or getting more information on preparation for your child's Confirmation. For more Sacramental Photos of previous years, please click on this link.